There is a culinary school located in Manhattan called the Institute of Culinary Education (ICE). A couple of years ago, a couple of friends and I signed up for the Cookie class there. It was 3.5 – 4 hours of pure, non-stop cookie baking, and not only did I have a blast, but I also had way over a pound of cookies to bring home. 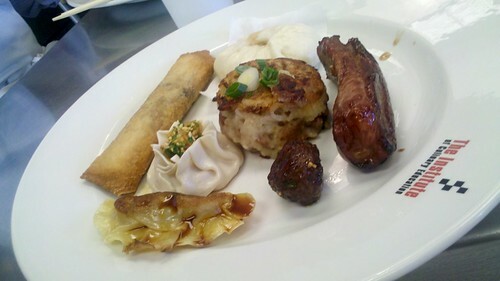 This year, another class caught my eye, Dim Sum. I was there! So, my friend Liz and I ventured back out to the Flatiron district ready to make some of those yummy dim sum treats we enjoy so much. The first hour was spent going over the ingredients, some basic knife skills and walking through the recipes. Then we self split into three groups, with each group tasked with a menu that consisted of a handful of recipes from our packets. 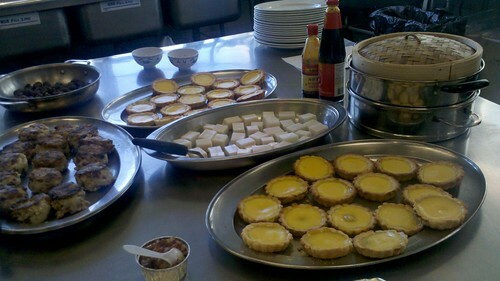 My group was tasked to make: Spare Ribs, Shrimp Shu Mai, Steamed Pork Buns and Egg Tarts. As the self proclaimed hunters (the two men in our group) got to work on the spare ribs, and the other woman took the egg tarts, Liz and I tackled the Steamed Pork Buns. I was psyched! Liz and I set out and followed the recipe for steamed pork buns. We first made the dough, which wasn’t too difficult. We made the filling, which also was not too difficult. I learned how to cut an onion so I get minced onion that actually consists of evenly sized pieces. That, in itself, made the class totally worth it. I think our only real hiccup was the addition of the baking powder water mixture to the risen dough. Everything in our baking selves said this wasn’t right. That was a lot of liquid to be adding into a risen dough. In the end, Liz won the debate and we got that liquid into the dough and let it rest for another 10 minutes. 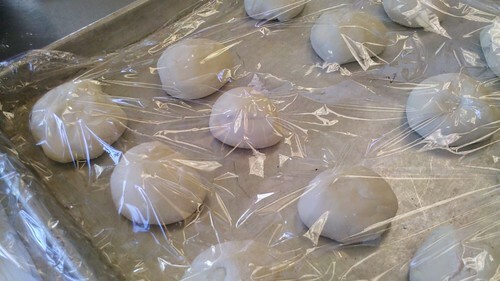 Dough was split into 16 pieces, rolled out, filled and folded up and placed in a waiting steamer. 15 minutes later, we were done! It was quite a spread as we put all the groups items onto the table. 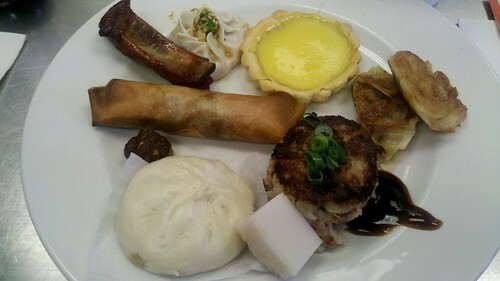 There were Spare Ribs, Shrimp Shu Mai, Vegetable Pot stickers, Spring Rolls, Hoisin Meatballs, Turnip Cake (law bak goa), Steamed Pork Buns, Egg Tarts and Coconut Jelly. Everything was delicious. The sauce that was made for the Shu Mai was excellent, and I will probably be making more of that sooner than later. The egg tart recipe made a shortbread crust for the egg. While I generally prefer the flaky crust for my egg tarts, this short bread crust was really good and probably a ton easier to make at home than a flaky crust. The stand out were the Spare ribs. I wonder if it was due to the quality of the meat or the sauce. Either way, it smelled delicious and tasted awesome. Those will be made again. 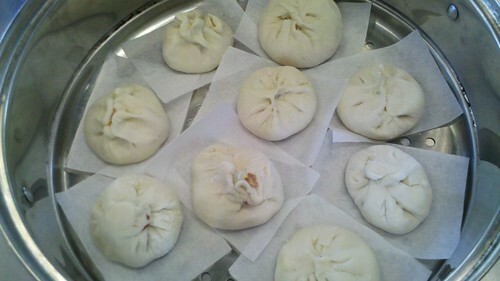 As for our steamed pork buns. There are a lot of lessons learned for next time (less onion, more pork, more filling per bun), but I’m glad we tried it in class, because there were a few steps there that needed some much needed consultation with the instructor. As we were leaving, we heard about a Chocolate Galore Class that was also offered….do we dare?